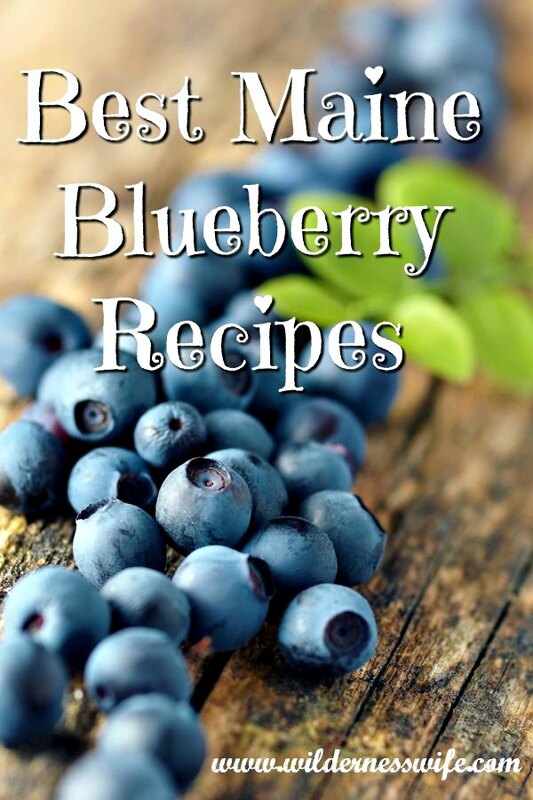 Blueberry season in Maine means great Blueberry Recipes! It’s Blueberry season here in Maine. In fact, down in Machias they are celebrating their annual Blueberry Festival August 18th – 19th, 2018. It is a great event with all sorts of things going on like crafts, entertainment, parades, and more. They hold it every year in mid-August so you may want to plan on joining in the fun. Click here to go to their website to check out all the events. The Machias Blueberry Festival is truly worthy of a road trip on even a vacation. 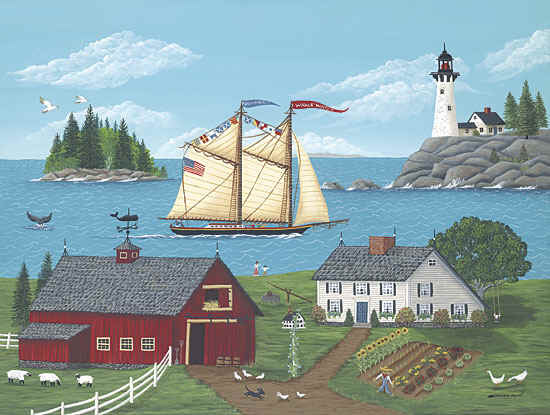 “Downeast” Maine, as this section of Maine is called, is where the Maine blueberry farming industry is centered so the folks in Machias know their Blueberries! Blueberries are very much a Maine thing and Washington County and town of Machias, in particular, are the epicenter of all things Blueberry for Maine. Go to the Machias Blueberry Festival and you will experience the tastiest of blueberry dishes and recipes that are to die for for the lover of these gorgeous indigo colored berries. Maine is famous for its blueberry barrens out on the northern coast, in the Machias area. And we Mainers have lots of Blueberry recipes in our repertoire. This recipe is just one of many that my family loves. There is nothing like having blueberries fresh from the field to create, muffins, blueberry pie, blueberry cakes, and my favorite, Blueberry Sour Cream Pound Cake. Here’s a recipe that is a huge favorite here at the Thompson household. OK, I know what you are saying, “Why is half of the pound cake missing?”. What you can’t see is Bill’s Bluberry stained lips and very satified facial expression. This is one of his favorite desserts, second only to Strawberry Shortcake. 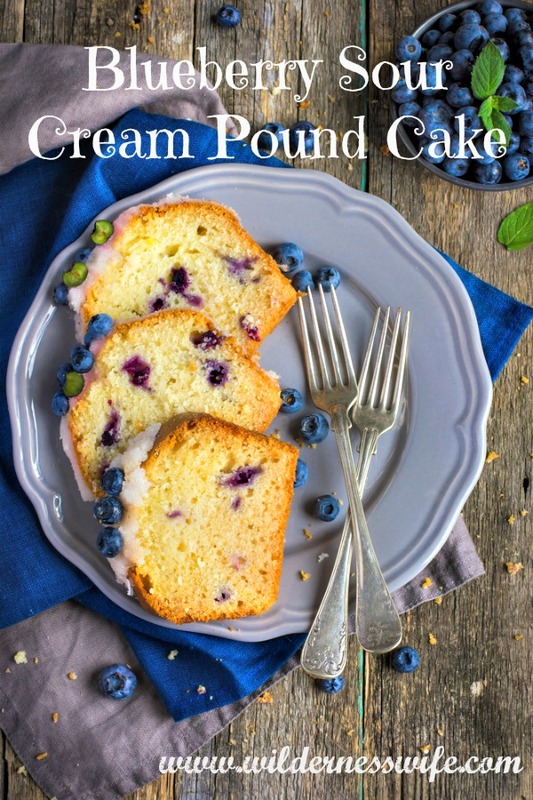 He likes this pound cake with some Maine blueberry syrup drizzled over it and a nice big dollop of fresh whipped cream….or just a piece cut off and in his hand as he heads out the door! That’s what happened to my cake today before I could photograph it…….. an attack from the Blueberry Bandit! Blueberry Sour Cream Pound Cake is absolutely moist and delicious. Try this very traditional Maine Blueberry recipe and get great results. Here in Maine we know our blueberries!!! Combine flour (except 1 tablespoon), salt, baking powder, baking soda in a separate bowl. Beat the butter in the bowl of an electric mixer on medium speed for 1 minute. Gradually add the sugar ¼ cup at a time, and then beat at high speed for about 8-10 minutes until very light and fluffy. Add one egg at a time, beating for about 1 minute between each egg. Be sure to scrape the sides of the bowl between the addition of each each egg. Add the sour cream and the flour mixture alternately ¼ at a time while beating on low speed. Again, be sure to scrape down the sides of the bowl through each addition. Dust the blueberries with the 1 tablespoon of flour (this helps suspend them in the batter so that they don’t sink to the bottom of the pan during baking). Fold the floured blueberries into the batter very gently, distributing them evenly. Pour mixture into a greased and floured loaf pan. Bake for 70 – 80 minutes in a 325 degree oven. Test for doneness with a toothpick making sure it comes out clean. Cool on rack for 20 minutes then remove from pan and allow to cool more. Serve with whip cream and blueberry syrup. 3.1.09You can also make this pound cake without the blueberries for the most delicious plain pound cake you have ever had. Then you can top it with any berry you like. Looks wonderful! I’ve been through Machias! We have friends in Perry. Terrific recipe! I wanted to feature it on the Friday Flash Blog on The Jenny Evolution, but you’ve got your pic locked. I’m definitely pinning this, though. One of our other linkers was just raving about the blueberries in Maine. This looks delicious. What a great recipe and I can perfectly understand why half of it is missing! lol! Thank You for sharing at the Fluster Buster Party! Join us again next week! Lizy party co host! We have a Strawberry festival here in Ponchatoula Louisiana in May every year. It is a great time, it amazing me all the wonderful things they create with strawberries. However, I could go for a blueberry festival, the cake looks good, pinning it to my dessert board. Hi Sheryl! I found your blog through Anyonita Nibbles Take Tasty Tuesday’s link party. This cake looks so yummy! I love pound cake. I’ve never tried it with sourcream and blueberries so I will have to try it soon. Pinning this and thanks for sharing it. Found and following through Inspire Me Monday at Create With Joy. That cake looks w-o-n-d-e-r-f-u-l! Can’t wait to try it with blueberries from the bushes out back! Oh how yummy does this look! Sharing and pinning. I’ll take 2 pieces please! Thanks for sharing at All Things Pretty! My mouth is watering just reading the recipe! Lovely recipe! 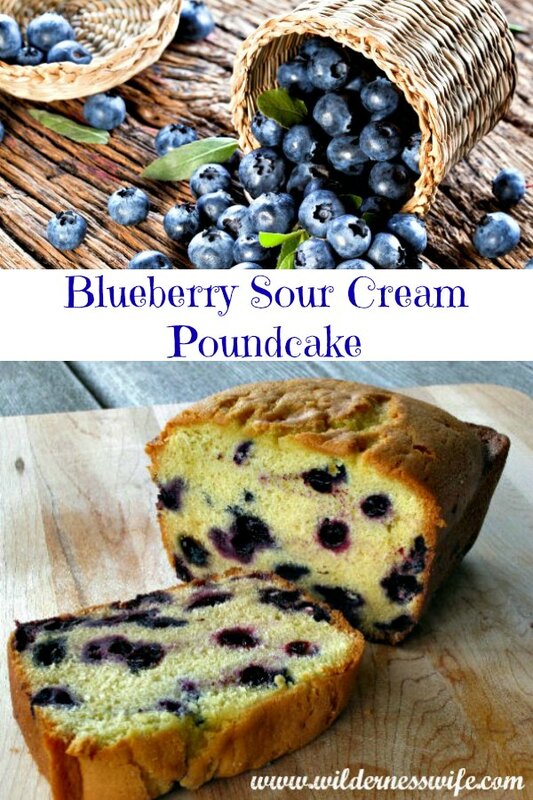 I love blueberries and I love pound cake so I will definitely be giving this recipe a try! Found you at the Practically Functional link party. Have a wonderful weekend! Awesome! anything blueberry for me. Last year our large bush yielded 7 quarts bags – this year, nothing. I guess it needed a rest? When the weather cools up down here in Georgia, I’ll have to whip this up 😉 Thanks for sharing. What a delicious looking pound cake!!! It looks wonderful with all those blueberries!! I would love a slice! 🙂 Have a great weekend! This looks very good and the recipe seems easy enough for even a beginner to prepare. I am going to share this recipe with a few friends that I know would love it! It is easy and always comes out good! Of course I have to give some credit to the delicious fresh Maine blueberries I use! Oh my, you got my tummy wanting a slice. Thanks for sharing with us at our Thursday Favorite Things Blog hop. Thanks for linking up to the Heavenly Treats link party. This recipe sounds so delicious!! Hi, I’m Anne from Life on the Funny Farm (http://annesfunnyfarm.blogspot.com) visiting from the TALU. Ohhh, this looks so delish! Must try. Anyway, it’s nice to “meet” you. I hope you can pop over to my blog and say hi sometime if you get the chance. Saw your recipe on Gunny Sack Linky Party #54. Looks delish. Thanks for sharing! Thanks for stopping by. Hope you try Pot-au-Feu! It’s delicious! Oh man o man this looks de-lish!!!! Thank you! I feel very honored! This looks delicious! Thanks for linking up for Friday Favorites. I’m featuring you this week! I really enjoyed checking through all your participants links…lots of variety and interesting information available on yur blog hop! Your Blueberry Pound Cake looks so good and the festival would be so much fun. 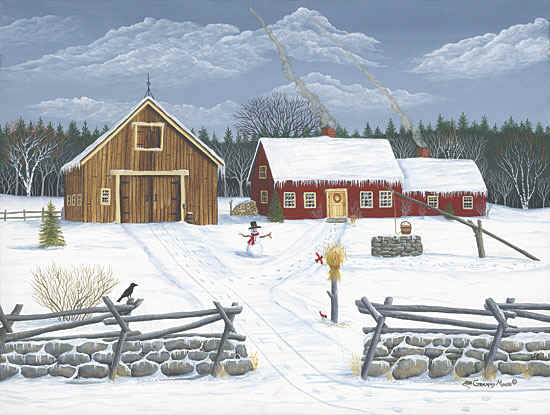 Hope you have a fabulous holiday weekend and thank you so much for sharing with Full Plate Thursday. Oh this blueberry bread pound cake looks wonderful!!!!! There’s nothing like a good pound cake, and I love the addition of the blueberries! Sounds so good! Blueberries are a great fruit. They are such a nice addition to a number of recipes and this one they take an ordinary pound cake to the next level! Yum! This goes nicely with my Lemon Blueberry Loaf from Must Try Monday. Thanks for linking up. Have a wonderful day! I just cheked out your loaf and both recipes are a great use of blueberries! Yum! This sounds delicious. This is a fantastic recipe! Would you consider linking this up at my Pinworthy Projects Party? I hope to see you there! I’d love too! Thank you for the invite! Just found your blog. I love blueberries and I wish I could find a place to pick them here in Iowa! We are blessed here in Maine with acres and acres of blueberry farms in Washington County along the northern coast. You’ve had a tough year out there in Iowa with the drought and all!Hope you get some rain soon! It is a very yummy deert…not too sweet and you can dress it up with sauces, syrups, and whip cream or eat it plain! Just a good all around recipe! Loved your story. Gave me a good chuckle this morning. The blueberries at our farmers market are about done now. I will surely miss them. There is nothing like the fresh blueberries. Those little plastic boxes in the grocery store just aren’t the same. Oh yum! This looks so moist and yummy. I love blueberries. I saw a huge patch growing in OR when I was there in July. I would love to someday visit Maine. The Blueberry festival sounds like tons of fun. Can’t say that I blame hubby for grabbing a slice as soon as it comes out of the overn. Thanks for sharing with SYC. On my ‘make’ list for sure! Maine is a beautiful state. We have a little bit of everything – the gorgeous rocky coast with windjammers, lighthouses, lobster and all the other great seafood: the central Maine area full of colonial villages, charming old farms, and rolling hills: and of course The Great North Woods (where I live) with millions of acres of forest, Mount Katahdin (the northern terminus of the Appalachain Trail), and hundreds of pristine lakes! Do come visit us……you’ll love it! Yummy! I will have to remember to make this next weekend! Thanks for sharing. Found you through Nifty Thrifty Things. I hope you do try it because it is yummy! Thanks for stopping by! New follower from the weekend blog hop. Following you though Twitter, NetworkedBlogs and Linky. Have a great weekend! Julie from Stlavonlady – a cat, girl, man and me! Mmmmmm. Maine blueberries! Maine was my fav state to visit as a teen. Pick the fresh wild blueberries across the street from my friends house was the icing on top! This post brought back many great memories! It is a great state! That’s why we moved here over 20 years ago! I love it! I just got fresh blueberries yesterday and now I know exactly what I am going to do with them! Thanks for such a yummy recipe! You’re very welcome! This is an easy and delicious recipe. Very, very moist! 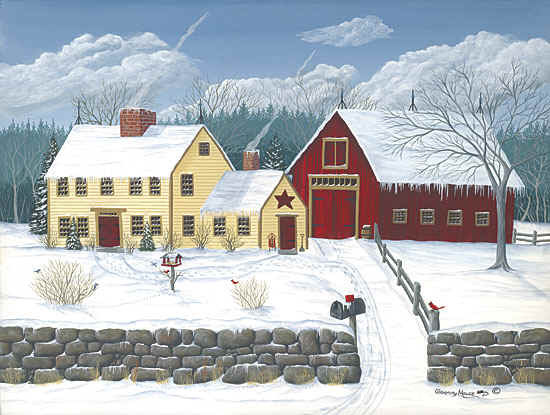 Hello, found your blog through a linky party… I live in Sabattus, Maine and am happy I found you!! I love finding others from Maine. I love blueberries and we had a bumper crop in my back field this year. Lots of muffins, pancakes and bread!! Hope you have a great weekend!! A fellow Maniac! Yeah! So nice that we are “neighbors”! And Maine blueberries are the best…..can’t get enough of them! This is going to be printed off and made…ASAP! I love blueberries and yesterday bought blueberry yogurt, Philly spread and blueberry bagels. I’m on a blueberry love fest -LOL-. You, my friend, are a blueberry addict! I know because I am too! And the plus is that they are good for us with all those antioxidants and stuff! Mine is in the oven. :] I’m using smaller blueberries that were just harvested in Lincolnville a day or two ago. I forgot that I didn’t have sour cream on hand so I had to substitute it, but (as unhealthy as eating raw batter is) the batter was delicious! Now the long wait to taste the finished product! Now I think I could eat the whole loaf. Those blueberries are huge! Those are Maine blueberries grown on the blueberry barrens of Washington County, Maine. They are delicious! Trust me….it is mega yummy!!!!!! As you will note on the menu at the top of the page a link for my “Recipe Disclaimer”. LOL I will never claim to be a healthy cook…..tasty ,yes, healthy….well, all things in moderation. It’s not always what you eat that will kill you but how much! And of course, when I eat my Maine Lobster, I drench it in butter! It is incredibly good!!!!! Try it and you’ll love it! LOL! Good thing you weren’t here because there wouldn’t have been a photo to post! Umm Wow! I think I found a new breakfast food! LOL! A girl after my own heart! Mmmm… wish I had this with my coffee this morning. Yummy! Sheryl that cake looks delicious! I know what you mean about it being as good as it looks! Thanks for sharing at the Back To School blog Hop my son would absoluteley love this! My grandmother always made a blueberry cake for me when I was little. She would give me a little tin measuring cupo and send me out to the blueberry patch near her house and I would pick until the cup was full. Then when I got home I would sit and watch her make the cake. I loved that cake and I loved sitting in her kitchen while she made it! Blueberries bring back good memories! It is very moist and the sour cream adds a nice richness to it! It as good tasting as it is good looking! Yummy!! I love pound cake but I’ve never had blueberry before. Blueberries are one of my favorites! Of course, living in Maine we have easy access to them with all the big blueberry farms in Washington County. Mmmm YUMMY! our season is long gone down here in the South, but I had major out put this year 🙂 Bookmarking this recipe to my online folder – thanks for sharing! It is a keeper! Very moist! Very tasty! 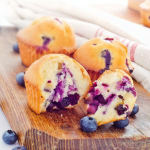 This sounds and looks delicious…we love blueberries and they’d make a pound cake incredibly moist I’m sure! The cake is incredibly moist! And the sour cream adds a real richness to it. Around our house it is a big favorite! Looks yummy! I have to try this. I love blueberries. This recipe makes a very moist, filling pound cake! I hope you enjoy it and stop back again as I am always putting up new recipes…..good old Maine amd New England comfort food. Mostly family recipes handed down through the years. It is delicious and very reliable recipe…always turns out great! 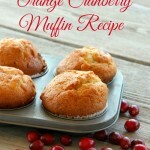 It is so yummy….really moist, not overly sweet,jusy right! Even without the blueberries and just plain it is fantastic! You can pair it with whatever seasonal fruit sauce you want. Very easy and makes a novice baker look like a super baker! It’s the perfect guilty pleasure!